A design that embodies the future. 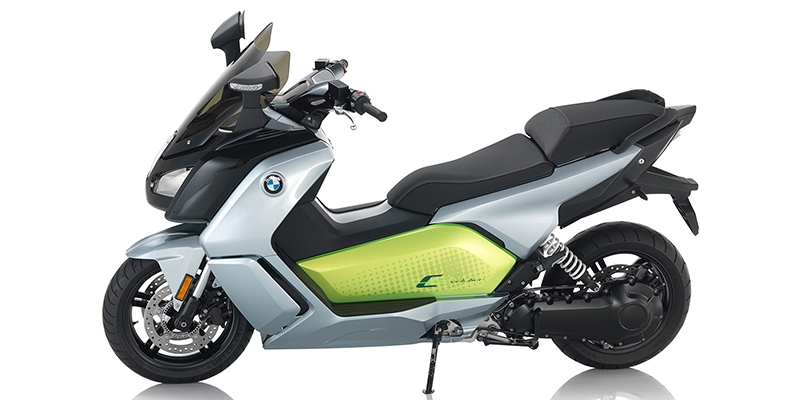 The shape of the C evolution is at first sight typical of BMW Motorrad. 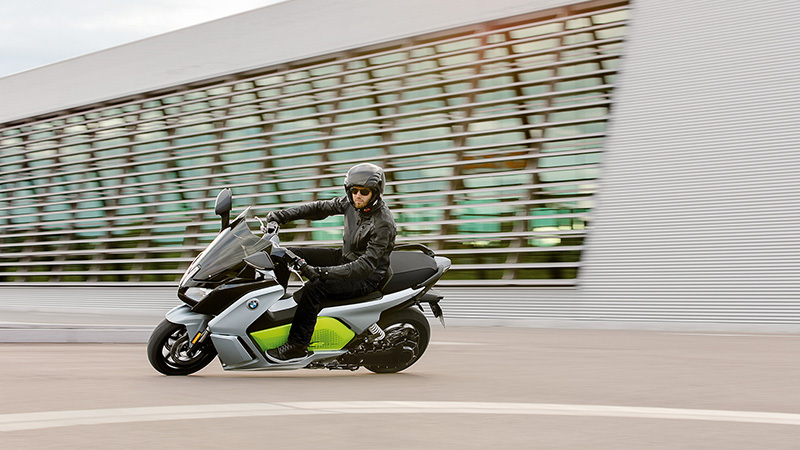 LED lights and a big TFT display reflect BMW’s technological leadership, while the striking split-face fairing shares its DNA with the rest of BMW Motorrad family. A statement is set by the new, attractive color Ionic Silver Metallic with an Electric Green accent color. 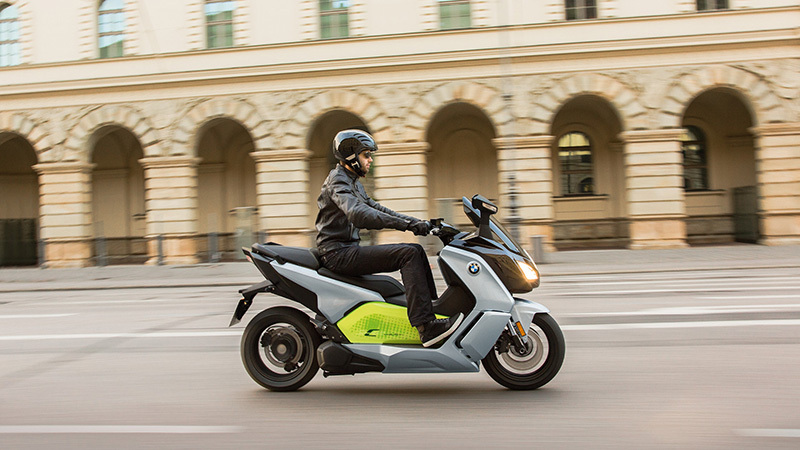 The graphic on the side covering adds to the electric scooter’s modern appearance. High-quality fit, finish and attention to detail complete the design elements of the C evolution. Contrary to conventional internal combustion engines, the C evolution’s electric engine provides peak torque from a standstill, instead of gradually building up to the peak torque. With peak output of 48 hp (35 kW) and 53 lb-ft (72 Nm) of torque at the output shaft, this machine provides immediate riding pleasure. The maximum speed is electronically limited to 80 mph to ensure optimized power consumption and range. With acceleration from 0 – 30 mph in only 2.8 seconds, you’ll quickly leave the traffic behind when the light turns green. Technology powered by BMW i. 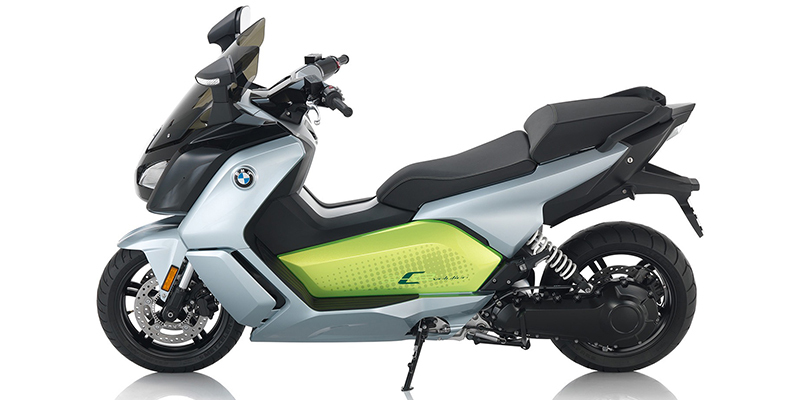 The energy storage device in the BMW C evolutionconsists of three modules, each of which has twelve lithium-ion battery cells. Thanks to the battery modules of the latest generation with 94 Ah as opposed to 60 Ah, the range of the C evolution is up to 99 miles (per WMTC). Entirely waterproof, the battery casing is made of die-cast aluminum and also houses the entire electronic control and charging system. It is both a supporting chassis part and a crash protector for the lithium-ion battery module. BMW i was the technological inspiration behind the C evolution battery. The high-quality modules are identical to those used in the BMW i3 and are produced at the same plant in Dingolfing. Parts of the electronic control system were also adopted from the i3 and i8. This covers voltage, current and temperature and ensures that the high voltage is securely activated and deactivated. A full charge of riding pleasure. 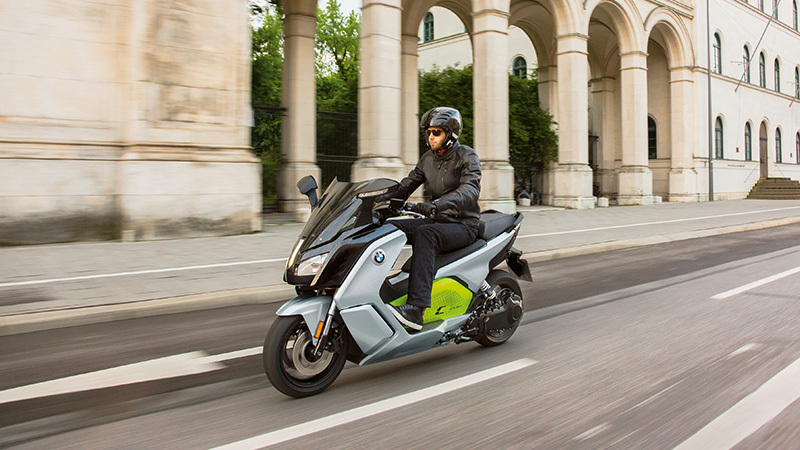 The battery in the BMW C evolution is charged using the integrated charging device, either at a regular household power socket or at a charging station. The charging plug socket on the vehicle is compatible with the car plug type 1. The standard charger cable fits household sockets. Alternatively it is possible to use a Mode 3 charger cable so as to be able to use public charging stations or wallboxes. This provides access to 16 A current for faster charging. The short charging times are especially practical in everyday use. As is the new Silent Charge mode, which makes charging slightly longer but much quieter. The C evolution sets technological standards and is characterized by its great versatility. 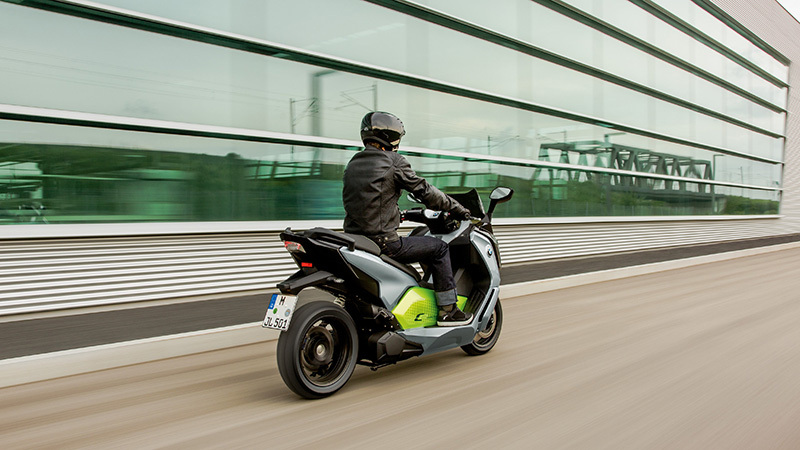 With its four different riding modes, the C evolution promises variable riding perfectly adapted to the rider’s wishes. 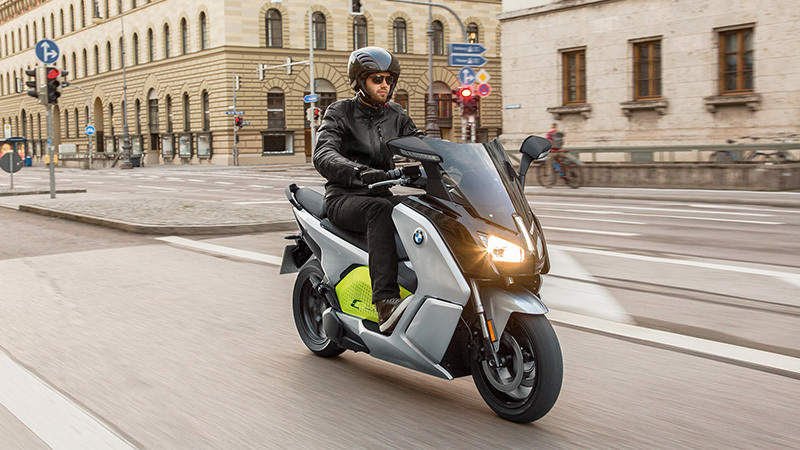 Innovative features like the practical Reverse Assist and Torque Control Assist (TCA) make one thing very clear: with the C evolution, you are a pioneer of a new movement – uncompromising in terms of riding performance and in environmental compatibility.